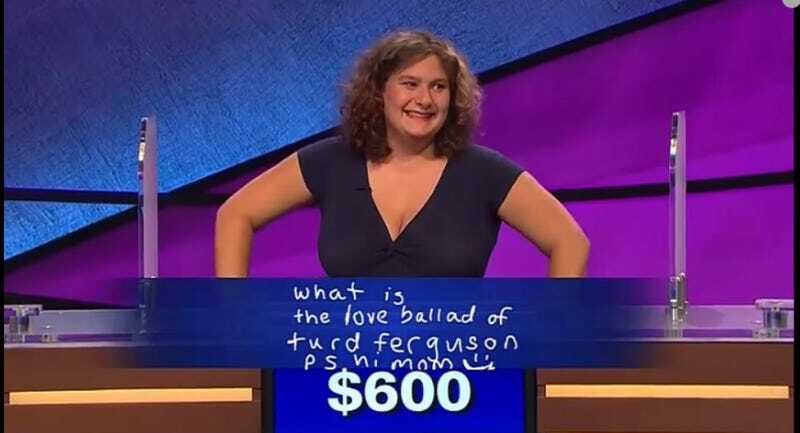 It’s always been unclear whether Jeopardy! host Alex Trebek is at all amused by the long-running Saturday Night Live sketches about his show, the ones that depict him near the point of tears or a dangerous fit of rage when dealing with the dumbest celebrity contestants in the world. Judging by Wednesday night, though, the answer appears to be no, he’s not. Trebek, a professional, read all that aloud without cracking, laughing, or yelling. Then he told Lavin she’d reduced her $600 right down to zero and moved rapidly along. Poor Trebek. And in a pretty healthy display of good humor, she retweeted all the commentary about her performance, even the less constructive ones.